In 1950, St. Louis was the eight-largest city in America at a bulging 850,000 residents. It was a twentieth-century city, buoyed by diverse manufacturing and a busy port. It was also a highly-segregated city, split strikingly into a largely-black north city and whiter, richer south city—but the entire urban core suffered from flight to the suburbs and industrial Midwest decline. Six decades later, the city is drastically different. The County bests the City's 300,000 population by three-to-one after sixty years of uninterrupted population loss. Understanding the causes and consequences of urban decline and evolving city life is difficult. It requires ten-, fifty-, and hundred-year perspectives and a close knowledge of economic and political contexts. One way we can better appreciate how our cities have changed is to visualize the effects of time, in maps and data. I was drawn to the hypnotizing displays of changing Midwest cities put together by the University of Oklahoma's Institute for Quality Communities. Simple sliders reveal cities universally carved up by the Interstate Highway System and uniquely altered by the effects of and responses to urban decline, such as the Arch grounds and Pruitt-Igoe projects in St. Louis. In each case we can directly observe how dense, residential neighborhoods were transformed into offices, or simply wiped clean by population loss and decay. One of my first exposures to the stark changes that St. Louis has undergone since its mid-century heyday was the simple and excellent Mapping Decline website to accompany Colin Gordon's book of the same name. Four maps show the great exodus from the city center and the racial covenants that forced black residents to remain in decaying neighborhoods, patterns that resulted in an intentionally divided region. The consequences of these policies and demographic shifts are felt now, decades later. Ferguson became a household name this past August in part because of unaddressed divides, seen clearly in Gordon's work. Visualizing how my city has changed is simply fascinating as well, not always so serious. I stumbled upon Elizabeth McNulty's St. Louis Then and Now at Dunaway Books on South Grand, just the kind of architectural coffee table book I was keeping an eye out for. In almost 70 paired photographs, McNulty shows us a St. Louis rising at the end of 19th century, barreling into the 20th, and the state of its urban neighborhoods today. The dramatic shift from bustling port to sleepy, abandoned riverfront is especially striking to see. 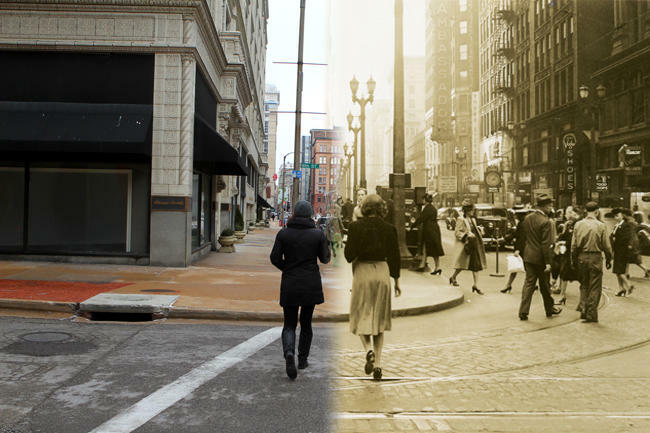 Similar sets of photos were assembled as part of St. Louis' 250th anniversary celebration, where streetcars make way for regular ones, and grand boulevards were once populated by throngs of downtown residents that have since left. Cities are as dynamic as the people who inhabit them and bring them to life. Many Midwestern cities have struggled for several decades, while coastal cities have largely prospered. The pendulum may be swinging back now as people—especially the young—increasingly seek out cities for their liveliness and density. These once-grand cities have serious problems to contend with, from racial divides to ailing school systems, but perhaps the twenty-first century will again see a rise of the cities that seemed to peak in the middle of the twentieth. I thought I was reading about St. Louis and wanted to look up this monthly cycling event that sounded like the Naked Bike Ride but more frequent. The city in question is not Portland, either, but rather Baltimore. In a profile of “The New ‘Cool’ Cities for Millennials,” The Christian Science Monitor uses Baltimore as the example of a series of infamously rundown, increasingly vibrant and even hip urban centers that increasingly draw the urban Millennial generation. Cleveland. Detroit. Nashville. St. Louis. Mid-sized cities with cheap rent, storied histories, and surprising economic opportunities for a generation pummeled by the Great Recession but still searching for places to make their mark. And although New York, San Francisco, and other metropolises draw the lion’s share of young, educated adults, these other, often overlooked cities are beginning to see rapid increases in these populations. Even as St. Louis has continued a six-decade population death spiral, the number of 25-to-34-year-olds with a college degree near the urban core has more than doubled, rising 138% from 2000 to 2010, the largest such surge in the country. Although this relative increase obscures absolute changes, St. Louis attracted more than half the demographic increase Seattle did over this same period (4,227 versus 8,209). St. Louis and other struggling cities have far to go, but they are going, and changing faster than many would have anticipated just a few years ago. In St. Louis, Downtown, Midtown and other central corridor neighborhoods were the only ones to gain residents from 2000 to 2010, when the city overall saw an 8% drop in population, perhaps a bellwether of a turning tide in the exodus from the city center. These neighborhoods include startup incubators like T-REX and Cortex, revitalized loft apartments, and convenient public transit. And St. Louis is the fastest-growing city for new technology jobs. ArchGrants, founded in 2011, provides non-equity funding to tech startups—as long as they remain in or move to St. Louis. LaunchCode, which rapidly trains new programmers and places them at area businesses, was recently lauded by President Obama for its successes and is expanding nationally. Tech may not be sufficient to power the city’s economy, but St. Louis’ low cost of living and access to capital make it a top place for starting other businesses as well. Although demographers cannot untangle the economic causes from the cultural behind the Millennial move toward cities, The Christian Science Monitor and other sources have identified a self-reported interest in dense, walkable, community-oriented neighborhoods over suburban sprawl among the young. The people profiled in the CSM piece—employees at tech startups and nonprofits—claimed Baltimore as a city where they could have an impact, where a vibrant urban lifestyle coincided with a small enough community to feel absorbed, not “carried along”. St. Louis offers the same opportunities to contribute to a quirky, very much in progress revitalization of the city. Upstart politicians can win by a mere 90 votes against an entrenched incumbent; individuals can ensure that local representatives listen to their constituents about critical bike infrastructure projects; shuttered corner businesses can be reopened to create a new community space; a brand new brewery can be self-funded. As a full-time graduate student, I can still find a way to contribute to outreach to the community gardening scene in St. Louis where other cities, San Francisco for example, might have those kinds of niches saturated by individuals who can commit more fully to single projects. In many areas of this city, there is both a need and room for interested individuals and small groups to get their hands dirty in making their communities better—the results are obvious, the actions of individuals visible. Demographers quibble over whether the Millennial move toward cities is stable, or whether family life, schools, and age will push us back out to the suburbs in the next decade or two. Time will tell. But it may be that the economic forces that favor urban centers only reinforce an intentional return to lively, dense cities. And that St. Louis, Baltimore, Cleveland or Detroit offer the more civic-minded—and more financially constrained—of our generation an opportunity to help forge the cities we will inhabit for decades to come. The Department of Justice released the findings of its investigation into civil rights abuses in Ferguson this week. The report is unsparing in its indictment of intentional racial bias within the police department and city government, and the unequal application of the law on black residents without cause. Analysis by people familiar with the DOJ’s involvement with other police forces suggests that the DOJ will forcefully compel their suggested changes, or dissolve the police department entirely. As striking as this report is—and as clear as it is to dispel the myth that race is not a factor—its effects are inherently limited. Ferguson is home to only 21,000 people, one of 90 municipalities in St. Louis County, which has a total population greater than one million. The independent City of St. Louis houses another 320,000 residents, more than half of whom are non-white. The DOJ may reform the Ferguson police department into an exemplary force, or dissolve it altogether and allow the St. Louis County police to patrol the town. Neither will sufficiently address the widespread problems facing the St. Louis region or the country as a whole. St. Louis is fragmented, divided intentionally over decades into white and black, rich and poor. Many other cities are similarly fractured. Forceful reform of a single police department, representing barely one percent of the region’s population, is nearly meaningless. The divisions that have contributed to St. Louis’ problems must be addressed alongside raking the Ferguson police department over the coals. Unnecessary police forces should be dissolved, and many of their cities absorbed into larger municipalities. The City of St. Louis and the County should be reunited in order to work together, not compete. Only a region so strengthened will be poised to lead the nation in meaningful reforms. Only if we heal these longstanding divisions can we turn a conversation into action. Bust open Ferguson, break it down and build it up into a city and a police force that serves its residents proudly and well. But to stop at Ferguson would fail St. Louis to an extent we cannot afford. St. Louis is a divided region. In 1876, the City of St. Louis voted to separate from St. Louis County, defining a surprisingly small city center, barely a quarter the area of Chicago, and making it one of the few major independent cities in the United States. During the 1900s, the City was divided into a poor, largely black North City and a more affluent South City. St. Louis was split again—not geographically but socially—in August when Michael Brown was shot and killed in Ferguson, a suburb in St. Louis County. What happened in Ferguson this summer was likely the inevitable result of the divisions with which St. Louis has never grappled. What is not inevitable is that St. Louis will seize this opportunity to heal these fractures. To do so, the region must recognize how these divisions were deliberately constructed, and pursue the intentional dismantling of their consequences. A racially-divided St. Louis was created throughout the twentieth century. The first half of the century was a story of growth and progress. In 1904, St. Louis hosted the first Olympics on American soil, alongside a World’s Fair. By 1950, St. Louis was the eighth-largest city in the country. Accompanying this rise, the city’s existing segregation into black and white was formalized. Redlining—the then-legal process of restricting housing by race—defined select neighborhoods where blacks were allowed to rent or buy. Existing black neighborhoods were considered a loss; white neighborhoods were protected from change. Even after redlining was officially prohibited, realtors and municipal decision-makers worked to maintain the same outcome: racially-restricted housing. Eventually, a large portion of North City was set aside for black residents, who were barred from most other areas by formal and informal housing covenants, including the increasingly affluent County suburbs. As the City’s population declined sharply after World War II, spurred by rampant white flight, the urban core was hollowed out. The same pattern hit many cities, especially other Midwestern industrial centers like Detroit, Cleveland, and Chicago. Housing restrictions kept black citizens from fleeing the blight, further concentrating poverty within the majority-black North City. Even well-meaning efforts reinforced segregation and poverty. The Pruitt-Igoe public housing projects, built in the 1950s, were hailed as a progressive solution to the problems of slums and urban decay, and the city leveled several blocks in North City to build the segregated high-rise buildings. They quickly fell into disrepair and attracted crime, deteriorating without financial support from the City to ensure upkeep. Barely two decades after construction, having cost hundreds of millions in today’s dollars, the failed projects were demolished. The neighborhoods cleared to build Pruitt-Igoe never recovered. Those in power did not control changing economies or demographic trends, but they did ensure that the worst effects were felt by an increasingly marginalized black population. Today, the former site of Pruitt-Igoe is surrounded by blocks with only a few houses on each street. North city is devastated: it was designed to fail, and it did. The echoes of this mid-1900s segregationist policy were felt in Ferguson this past summer. When the City voted to separate from the County in 1876, City residents were worried about the poorer, sparser County siphoning off tax revenue. As suburbanization boosted the County’s population and wealth, this separation increasingly hurt the City’s financial and social position. And divisions continued: dozens of cities incorporated within St. Louis County during the twentieth century, a process of balkanization that created the 91 distinct municipalities that exist today. One ‘city’ has a population of 12. This creates a complicated map of overlapping taxes, school districts, and police. The very real effects of these confusing divisions were seen this past August. A Ferguson (population: 21,000, 67% black, North County) police officer who lived in Crestwood (population: 12,000, 94% white, South County) shot Michael Brown. The investigation was handed over to County Police, an overarching force that has authority over, but does not patrol, Ferguson. The County Prosecutor’s office in Clayton (population: 16,000, 78% white, West County) oversaw the grand jury proceedings. Calls for everything from body cameras on police to altered hiring practices have to contend with the political realities of this municipal patchwork. After housing restrictions were lifted, black flight followed older waves of white flight, predominantly into North County, to escape the decay of North City. Cities like Ferguson and Florissant, northwest of the city limits, shifted from largely white suburbs to racially-mixed, but poorly-integrated, communities. City councils and police departments, staffed largely by officers from other towns, did not shift accordingly. This is the context in which Ferguson became a household name. In Ferguson, newer black residents concentrated in middling apartment complexes in one corner of the city. Police calls and patrols became more common in the area. Tensions increased between police and the apartment residents. Darren Wilson and Michael Brown interacted for all of ninety seconds before Brown was dead and Wilson went into hiding, but the forces that brought them together on August 9th were slowly churning for decades. Since that day, the world has watched waves of unrest and violence. Riot gear, arson, and tear gas made headlines on the warm nights of August and again following the grand jury’s decision not to indict Wilson in November. News networks broadcasted burning cop cars side-by-side with President Obama’s appeals for calm. Yet despite the endless visuals of violence and the portrait of a community seeming to self-destruct on national television, much has happened in St. Louis out of sight of the cameras that shows a first step toward progress. In Ferguson, volunteers came out each morning to clean up the debris from protests the night before. With the start of the school year delayed, donations of school supplies flooded in to churches and community centers, and libraries offered free lessons for children. Peace vigils sprang up in neighborhoods around the region. Protests marched through downtown St. Louis at the foot of the iconic Arch to call for peace and change. Universities assembled panels of experts in law, policing, and civil rights to provide context and information. Antonio French, a North City alderman, founded #HealSTL, a social media volunteer organization, and opened a storefront in Ferguson to coordinate long-term efforts. Missouri Governor Jay Nixon formed the independent Ferguson Commission—whose members range from young black activists to police officers to clergy—which is charged with finding a path to a stronger region through communication and action. When the grand jury declined to indict Darren Wilson, protests marched along South Grand, a strip of shops and ethnic restaurants at the center of South City, far from Ferguson, but a secondary epicenter of protests. Around a dozen windows were shattered and businesses rushed to board up damaged and undamaged storefronts alike in anticipation of more protests. Right away, the neighborhood associations put out a call for materials, artists, and volunteers to decorate the plywood. Hundreds of people came out all day and night to paint images and words of support, turning a symbol of a broken community into uplifting messages of healing and love. Rather than exist for weeks as a boarded up ghost town, South Grand was transformed into an impromptu art walk. Few such events grabbed national attention, but they have galvanized St. Louis communities and brought a shaken populace together in the wake of tragedy. They seemed to begin the slow—painfully slow—process of healing. No one can know if St. Louis will face the aftermath of the events in Ferguson with the resolve to address the long-standing divides that culminated in Brown’s death. Protests last weeks or months. Progress takes years and decades. The Ferguson Commission is encouraging dialogue and new ideas while the conversations St. Louisans have with each other every day open new channels of communication over old separations. This fractured and segregated city took decades of concerted effort and troubling economic forces to create. St. Louis now requires the deliberate interventions of many to repair itself and move toward a community that is brought together as purposefully as it has been divided. Three weeks ago, a Grand Jury declined to indict Officer Darren Wilson in the shooting death of Michael Brown. Witness accounts differ in the level of aggression Brown displayed toward Wilson, but he was unarmed and did not earn a death sentence by his actions. As anticipated—and arguably egged on by a frenzied media presence and worsened by prosecutor Robert McCulloch’s timing and tone—planned demonstrations and protests quickly turned into rioting and arson along Ferguson’s roads. Cars burned alongside the infamous split-screen image of President Obama calling for calm. Following the shooting of Vonderitt Myers in the Shaw neighborhood, a smaller epicenter of demonstrations in the previous months has been south city, where I live. Marching up and down Grand, the major thoroughfare, protests were peaceful before I went to bed Monday night. However, I woke up to news of busted windows up and down the South Grand district of shops and restaurants a block from my house. Broken glass is not comparable to unequally applied justice or racial inequities or ongoing mistrust between police and the communities they serve. But it does represent fractured communities, scare people away from our neighborhood, and distract from efforts to make progress on issues brought up by Brown’s death. So I was lifted up as the neighborhood associations in south city put out a call for materials and volunteers to decorate the plywood that covered broken windows and protected whole ones from further damage. Hundreds of artists and neighbors came to paint the plywood boards, turning a symbol of broken communities into uplifting messages of healing and community. Rather than exist for a week or more as a boarded up ghost town, South Grand was transformed into an impromptu art walk. I walked around to snap pictures and thank the people who were painting. I was waiting to join a community meeting at the new pocket park on Grand where local leaders and aldermen would speak and neighbors would chalk messages of love for St. Louis. Here are the pictures I took. The boards are starting to come down. It is peaceful at night in my neighborhood now. But that should not be permission to look away and ignore what Brown’s death has brought to the forefront. I do not believe that we need to break our communities to have them heal stronger, like a bone. But I do know that to let these problems fester unaddressed will lead to further heartache and greater problems in the future. So let us move forward and heal not just the symptoms but the underlying rot so we can have stronger and healthier communities. See the rest of the pictures after the break. Last Saturday, a young man named Michael Brown was shot and killed by a police officer in the inner-ring suburb of Ferguson. Since then, the world’s eye has turned on our city. They have seen police in militarized gear, violent protests, and looting. They have seen Al Sharpton and Jesse Jackson. They have seen headlines like “Baghdad USA”. Soon the world’s judgmental eye will turn toward the next catastrophe. I promise you, we will still be here. This is our home. Although I am protected, both by privilege and geography, from the nexus of events happening in Ferguson, I have been deeply affected. I am a transplant to this city, but if you look over to the sidebar you will see I am a passionate St. Louisan. No zealot like the convert, I guess. I was saddened by the death of Michael Brown and I was shocked by the outbursts of violence and police crackdown. I have been glued to my news stream every night, hoping for peace as the sun goes down. I know one reporter who has sacrificed sleep and risked harm to cover these events and I have hoped for her safety. I have felt tremendously useless, randomly breaking down into frustrated tears. First let us first not forget that the primary issue is the loss of a young man’s life. Michael was deprived of due process and in seconds a man six years my junior ceased to exist and opened a hole in his family’s hearts. Empathy is not something to be given selectively, and I also feel for the officer and his family as they have fled their home. The broader picture asks what disparities led these men, both products of their circumstances as we all are, into a tragically fatal interaction? Why are black men stopped disproportionately in American cities? What are the consequences of discrepancies between the governed and their civic leaders? Why does economic disparity and disparity of opportunity so closely follow racial lines decades after most formally racist policies fell? And, most importantly, what can we do to address the inequities faced by racial minorities in this country? These questions have only partial answers and partial solutions right now. While the world has seen the violence and the police response, I have seen many more things. I have gathered with neighbors from Tower Grove East in support of Ferguson’s community and listened as my neighbor described her son’s fear of riding a bike on our streets and interacting with police. I have joined with my city at the Arch—the symbol of St. Louis that never ceases to bring a smile to my face—to support peace. Lighting a candle for Ferguson that evening led me to a conversation with my neighbor who was doing the same. I listened to her thoughts on the events, and we discussed race in our city and the topic turned toward the divine and how it might be found in all of us. I have had endless, breathless conversations with colleagues and friends trying to wrap our heads around this tragedy, the media’s portrayal of our city, and what race means in the twenty-first century Midwest. These acts do not bring justice to a family deprived of a son. But as our city threatens to tear itself apart as the world watches, I cannot help but hope these small acts help suture some of those wounds, however slowly. This is far from over. I expect that soon the media—which occasionally outnumbers protestors in Ferguson—will largely disperse, leaving our local reporters to continue coverage. Calm has not yet settled over Ferguson at night and police tactics change daily to cope with unrest in the midst of peaceful, passionate demonstrations. Due process will be had slowly for Michael’s family as investigations churn on. Real change, if it is to be had at all, will only stem from committed action over months and years to grapple with racial and socioeconomic divides in our city and across America. I am not a religious man. Sometimes I wish I were. Instead of prayers I offer my thoughts and hopes to Michael’s family, to the police charged with defending a community, to Ferguson, and to my city, St. Louis. May we find peace. The shooting death of an unarmed teenager in North County this weekend has shocked St. Louis and brought attention from around the country and around the world. There has been a pit in my stomach since hearing of the death of Michael Brown and the subsequent response, which last night included rioting and looting by people who have no investment in the community they performed those heinous acts in. But it is not to give the violent minority more attention that I write this; it is to make whatever small contribution I can to an ongoing conversation about police and the communities they serve. Below is a letter I have drafted for St. Louis City Mayor Francis Slay. I am a city resident and not a constituent of St. Louis County or Ferguson. But these issues touch the entire St. Louis region and I wished to contact my personal representatives. I am mailing similar copies to St. Louis Police Chief Sam Dotson and my Alderman, Stephen Conway. If you are interested, you are more than welcome to use this letter in whole or part to contact your own representatives. Some relevant contact information is below the letter. My thoughts are with the community members who are truly affected by this. Remember that we are privileged to live in a society based on democratic representation. However imperfect, this system of government does allow our voices to be heard. Be sure to speak loudly and clearly. A young man named Michael Brown lost his life in Ferguson this weekend. This tragedy—and any loss of such a young life can only be considered as such—has highlighted tensions between communities and their police departments and put St. Louis on the nation’s map for the worst of reasons. I am writing to you not only to express my sadness at this death but also to call for measures that could prevent more violence and lead to swifter justice when police do use force, whether justified or unjustified. In the twenty-first century, eyewitness accounts are increasingly being supported by audio and video recordings of events. As the technology improves, the feasibility of video recording increases as the cost plummets. Initial experiments, such as in Rialto, California, show that body worn cameras can reduce the use of force and help officers avoid unfounded complaints. Police forces like the LAPD and civil rights groups like the ACLU support the testing and use of these cameras to calm tense situations, increase mutual respect between police and their communities, and of course to provide evidence in the event of a criminal investigation or loss of life. I am calling for the St. Louis police force to assess, test, and ultimately adopt body worn camera technology. As a city, as a community, we condemn the violence that outshone peaceful protests this weekend. The relatively few individuals who participated in such behavior must not be given even a modicum of support. But the wider community of Ferguson, of St. Louis, deserves answers about the shooting of an unarmed teenager. If official cameras recorded the events on Saturday, answers could be quicker to come and justice could be had more swiftly. More significantly, a culture of accountability could have prevented excessive, deadly force. New initiatives will not restore a life that was taken, but could improve our community in the future. I urge you to take action now. Edit: A petition for something quite similar. Not my own. Urban humanism suggests that when cities bring diverse groups together, communities thrive. We understand one another, even if we are different, because we live and work and play side-by-side. Our ideas bounce off one another more quickly and effectively than if we had to shout into a suburban abyss. Just as universities bring together great minds to do great works, cities pack together the raw resource of humanity, people, into bustling, jostling, fun, joyful, scary, wonderful urban cores and we are better for it. How do we make sure that cities thrive? How can urban areas serve their residents and be served by them? By putting the policies and infrastructure in place to make strong local communities that have the right amount of autonomy over their neighborhoods. Strong local communities, connected by smart infrastructure, make strong cities. And strong local communities are, among other things, walkable. Walkability is a hot topic right now. Millenials (all those young people writing blogs about made up terms like urban humanism) drive less and want to live in dense urban cores. Walkability is a catch-all term for the qualities that attract anyone to an urban area: close-by necessities and luxuries; green spaces; neighbors and visitors mingling. (Obviously this all includes bikability too; alternative transit options promote the walkable mindset). How does walkability promote strong communities? By turning residents into neighbors. Walking induces those chance encounters that make cities so powerful, while driving actively prevents them. These interactions with people on the street introduce us to the people we live by, giving us a chance to realize what we have in common. Hell, just looking one another in the eye—you know, acknowledging the existence of another human being—makes both parties happier. Strong communities are strong because they are communities of individuals who know one another, help one another, and work to achieve common goals. So what does a real walkable neighborhood look like? Well, this is just one example: I was spending time in the Tower Grove area and although the South Grand district is certainly walkable and bustling, I am always captivated by the corner business. South St. Louis City has a lot of existing and defunct businesses built right smack dab in the middle of neighborhoods, providing a great example of mixed-use residential/commercial areas that encourage walking. Hartford Coffee Company and Blackthorn Pizza Pub are both great examples in the Tower Grove South neighborhood. Unfortunately, a lot of these have been converted to residential use, perhaps because a drop in population meant fewer businesses could be supported in the neighborhood. Population density, once again, comes up as a key resource for developing thriving urban areas. You’ll almost never see this trend of corner businesses in suburban development, but it encourages neighbors to mingle and be, well, neighborly. There is also a tremendous urban park, ample biking areas, and a busy commercial district nearby plus mixed single- and multiple-family housing. All of these amenities promote ambling about and the mingling of diverse people. And walkability is promoted by a few pretty simple concepts that have been set aside for several decades but are apparent in some of the most thriving communities. Designing streets (not stroads—yes that’s a term now) that provide for pedestrians over cars. Street level housing that doesn’t retreat from the sidewalk. Mixed-use residential/commercial districts that promote integrated businesses over strip malls. Public transit and bike lanes. Deceptively simple things that can all add up to a friendlier, stronger community. The ideas behind urban humanism can be read in a city’s street grids. Walkable areas are urban, in that they rely on densely-packed areas that reduce sprawl and can support local businesses; and humanistic, encouraging us to look one another in the eye, smile, say hello and share a thought, a small piece of our time and consciousness to tap into that most important resource: other people.